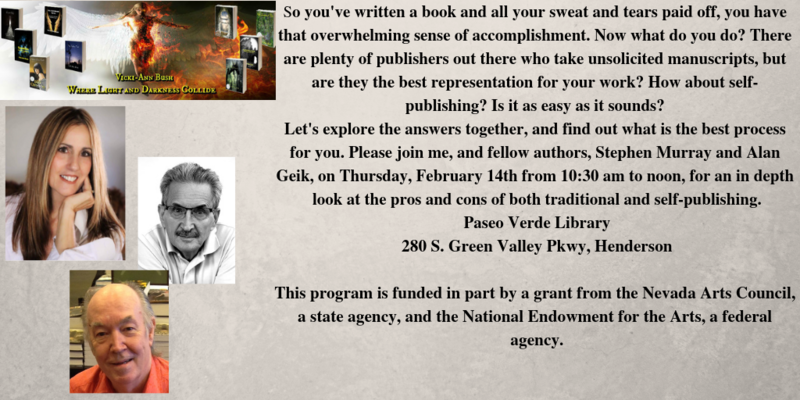 Panel Discussion – To Self-Publish or Not – Paseo Verde Library. « ‘Meet & Greet’ Signing at Barnes & Noble, Boca Park. It is an honor to be part of this panel discussion with fellow authors, Vickie-Ann Bush and Alan Geik. The discussion will focus on the benefits of traditional publishing versus independent or self-publishing. Thanks to Paseo Verde Library for hosting this event, and the Nevada Arts Council and National Endowment for the Arts for their grants to partially fund this event.